It’s chilly AF in Park City, Utah right now, so celebs attending the Sundance Film Festival have been forced to bundle way up. Rocking a pink coat with a hefty collar, Elle Fanning offered up a perfect example of how to stay warm in style — and we’re forever grateful. While we tend towards darker colors in the winter (and we’re sure many of you do, too) Fanning’s pastel pink Max Mara overcoat shifted our view on light-colored outwear. It not only paired well with her pastel blue, bow-tie blouse and beachy blonde locks, her outfit also brightened up the room around her. 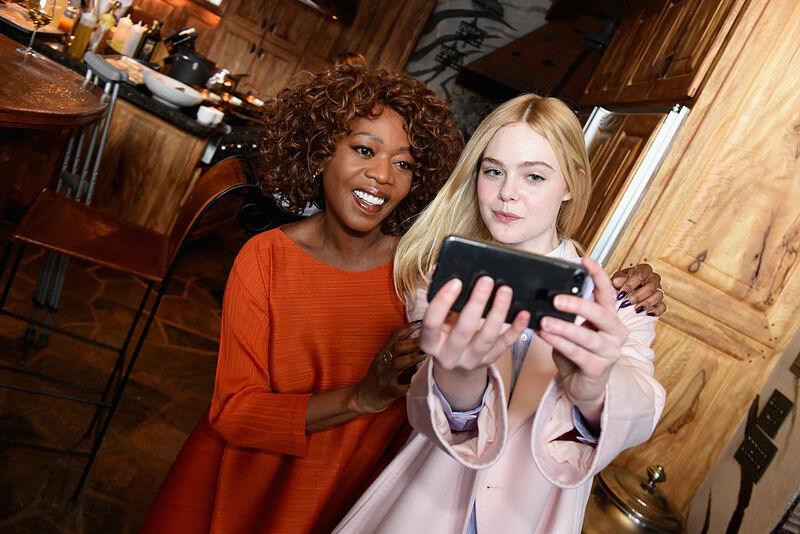 Attending a lunch celebrating films “powered by women” and hosted by Glamour‘s Cindi Leive and Girlgaze’s Amanda de Cadenet, Fanning met with fellow A-listers including Luke Cage actress Alfre Woodard, film icon Shirley MacLaine, and Transparent creator Jill Soloway. Fanning has been promoting her new indie film, Sidney Hall, while at Sundance. The film, which co-stars Logan Lerman and Michelle Monaghan, centers around the life story of the titular character, who “writes the book of his generation before disappearing without a trace,” according to Variety. Throughout the festival, Fanning’s outfits have been on point, always polished and true to her elegant and sophisticated — yet out-of-the-box — style. To a recent panel, for example, she wore wide-leg, high-waisted trousers with a plain white tee tucked in, and looked absolutely flawless. She may be just 18 years old, but she’s fast becoming one of our go-to style inspirations!